 Pour Confidently With The California Wine Club! What's a claret? It's an old name, rather British, for a red Bordeaux blend. Today let's take a look at an American version - a.k.a. Meritage - that was the people's choice in a recent tasting here.  Pour Confidently With The California Wine Club! The California Wine Club guarantees every wine featured because they do what other wine clubs do not.  Hahn Estates 2006 Central Coast Meritage Red Table Wine ($17.99) In competition with two other American Bordeaux blends and three from Bordeaux, this one took first place on pleasure points. 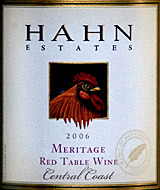 Hahn Estates 2006 Central Coast Meritage Red Table Wine won a consumer taste-off among six "claret" wines - three Merlot-dominant Right Bank Bordeaux and three California Bordeaux blends - ranging in price from $18 (for this one) to $30-plus. Even as the lowest-price wine of the group, the Hahn won "easily," said John Johnson, proprietor of The Wine Rack on Louisville's historic Frankfort Avenue, a shop that wins my affection for a small but eclectic collection and, mainly, for Johnson'a excellent knowledge of wine and food. It also bears the distinct advantage of being the only wine shop in the world that I can walk to from my home in five minutes.  Claret, as noted above, is an older term, originally British, for red wine, specifically Bordeaux. It likely stems from the French "Clairet" ("Cleh-RAY"), used in early times to distinguish the light, clear Bordeaux reds from their more dark and murky competition. Clairet has been resurrected in modern times, at least as a niche market, as a light, fruity and early-drinking Bordeaux available at modest prices. I haven't seen it outside France. But when you read or hear of "claret," you can assume that the topic is a Bordeaux-type red.  Meritage is a modern English word, coined in a contest in the 1980s, intended as an American synonym for "Bordeaux blend" or even "claret." It's supposed to be prounced as an English word, to rhyme with "heritage," but just about everyone these days assumes it's a French word prounces "Mair-uh-tahzh," and even knowledgeable sommeliers often slip up. The concept has survived, and many wineries do register to use the name; but many more decline to participate, sticking with "Red Table Wine" or even "claret" or simply proprietary names. As for the Hahn Meritage, it's easy to see why it was a crowd-pleaser. It offers up plenty of appetizing fruit, relatively restrained oak influence, and plenty of acidity and tannins for balance without harshness. Like so many modern California wines, its alcohol level is a bit frightening at 14.5%, but in fairness, the alcohol is well handled and doesn't come across as unpalatable heat. My tasting notes are below. First month just $13! Use Promotional Code: WineLoversPage during checkout and save $34.95 on your first month. FOOD MATCH: A bold wine that calls for robust flavors and finds them in lamb burgers made from natural Kentucky Dreamcatcher Farm lamb and lightly flavored with Indian spices and garlic..
VALUE: It demonstrates its quality as winner of a casual wine-shop tasting among wines that cost significantly more. Stands well above its competition for less than $20, but shop around, as it is widely discounted. WHEN TO DRINK: The varietal content suggests ageworthiness, and the wine certainly has =sufficient structure to carry it for a few years in the cellar. Its accessible fruit suggests that it's really intended for early consumption, though. I'd drink it over the next five years or less, and then only assuming good cellar conditions.